2011 was a great year for me perfume-wise. It was the year that I discovered a whole new set of perfume bloggers; the year I discovered and fell in love with some of my favorite perfumes ever: Carnal Flower, the Aftelier line; the year I finally sampled Ormonde Jayne. The year that I had a little extra birthday money to actually buy some of my favorites. The year that I discovered vintage perfumes on ebay as well as ebay bidding and sniping (thanks to the fabulous Mals). It was also the year of one of my favorite perfume experience ever: going perfume sniffing and shopping in LA with my mom (who was visiting from India). I followed where her nose led and was amazed at and quite proud of her tastes. She loved Mitsouko, Parfum de Therese and Jubiliation 25, PdN Le temps d’une fete, Puredistance Antonia and Chanel Cuir de Russie. It gave me great joy to see her take furtive sniffs from her wrist when she thought no one was watching. It was like looking into a mirror!! Now I can conveniently blame my fragrant obsession on my genes (and so does my husband). Following her nose, I explored genres and perfumes that I hadn’t sniffed before. After much exploring I found patterns in her taste – she loved green florals and fruity chypres! And because of her, I discovered my own great love for all kinds of chypres : dirty, fruity, leathery, animalic. It seems almost impossible to pick just one favorite from the Aftelier perfumes- I love so many of them! But for this list I think I’ll pick the easy loves- the ones I fell in love with at first sniff. Often easy loves don’t last but these did. 2. Aftelier Cepes and Tuberose : Unlike Tango, this was love at first sniff. I found it so easy to like that I thought I’d get over it soon enough, but after several wearings I still love it. This perfume makes me happy! Not a frivolous, flirty happiness but like a golden ball that I’ve swallowed whole, it lights me up from inside. I’ve attempted to review it but I find this perfume impossible to analyze and I don’t want to tease apart its notes. It is rich and earthy and sweet and beautiful and vibrates at exactly my frequency. And it deserves its own post, so more on it later. 3. Aftelier Secret Garden : The moment I smelled this I thought “this is what perfume should smell like”. It is mysterious and seductive, yet strangely comforting and smelling it makes me feel like I’ve found something precious at the bottom of a dusty wooden treasure chest. I have hemmed and hawed about buying it because of the animal ingredients but I have a feeling that a bottle of this might be mine yet (AAh- the things we do for beauty!). This is probably one of the more accessible of Mandy’s perfumes and if you love vintage perfumes in the vein of DSH Pandora, I highly recommend that you try it. 4. DSH Perfumes Pandora : This perfume smells freakishly like my great grand mother. I even called her up the day I smelled it to find out exactly what she wears. I haven’t found a satisfactory answer but I think something about the scent of sandalwood powder that she uses along with the smell of her makeup and silk sarees generate the scent that seems so similar to Pandora. This perfume was so evocative of her that I thought I might not be able to wear it, but turns out it is just so lovely that I can and do and definitely want a bottle of. 6. Prada Cuir Ambre parfum : Cuir Ambre revealed the beauty of leather perfumes to me. It was soft yet deep and smelling it I understood the structure of Rien better. I realized how Rien was created as an amping up of leather, ambre and animalic notes. 7. Puredistance M : Oh what a beautiful amber this is. Everything about this perfume is so smooth and I don’t know, gentle? There are no sharp edges or corners, yet it is satisfyingly deep and interesting. Gently leathery, gently ambery, with a liquid thread of spices that reminds me of a muted Caron Poivre. 8. Parfum d’ Nicolai Le temps d’une fete : Dappled light , dappled light, dappled light. That is what I want to say when I think of and smell this fragrance. A pool of green tinged dappled light that will now forever be my mother’s scent. She wore it for the first time this year, but it just melted into her skin and became her perfume. 9. Sonoma Scent Studio Champagne de Bois : As many people have pointed out, this perfume is reminiscent of Chanel Bois des Iles (the beginning also reminds me of Givenchy Organza Indecence). However, I find my decant of the recent Les Exclusifs version not as satisfying as I remember it being. But where Bois des Iles doesn’t satifsy, Champagne de Bois steps in. It is chewy and thick and the sandalwood note is swoon-worthy. Many thanks to the generous Rappleyea for my sample. 10. Vintage Chanel No. 5 parfum : My first bottle of vintage perfume. 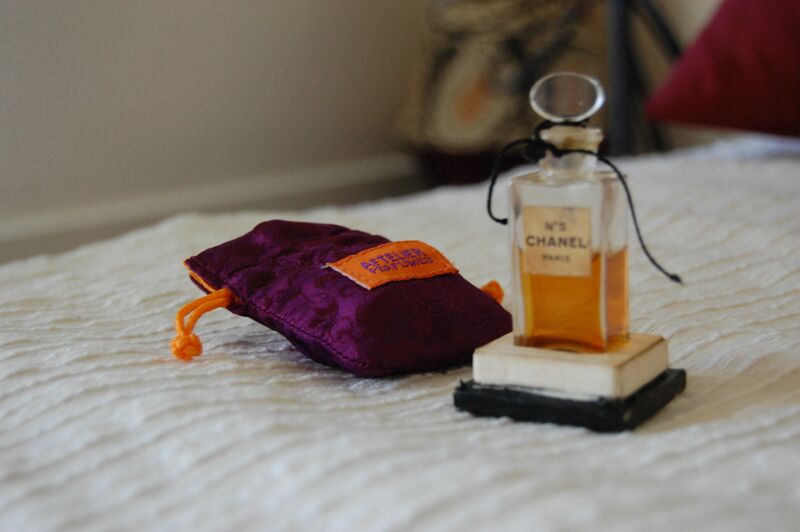 Also my second bottle of vintage perfume (yes- I was greedy and bought two bottles.). Chanel no. 5 was exactly the kind of perfume that I didn’t want to wear 6 years ago. It is exactly the kind of perfume that I want to wear now. It is perfumey and old fashioned and powdery. And Grand. No. 5 was released first on 5th May which is my Birthday. I discovered it just before my 5th wedding anniversary. the first bottle (50s vintage) turned out to be my 5th wedding anniversary present (unsniffed) . You have to admit, I was destined to love this! 11. Vintage Christian Dior Miss Dior and Amouage Jubliation 25 : aahh- chypres. Two very different kinds of chypres but both evoke ambery-gold textures in my head. Miss Dior is gloriously animalic and I wear it even though my husband makes a face every time he smells it. I fell in love with Jubiliation 25 after I bought a decant of it for my mother. It reminds me of Indian Weddings and is the perfect scent to wear with a maroon kanjeevaram saree. 12. Guerlain Shalimar parfum : This was also the year, I finally ‘got’ Shalimar. I show considerable restraint by not wearing it to work. I apply lavishly at home though, much to my husband’s dismay. Yes- I cheated. There are more than 10 perfumes in this list. But as I said, before- this was a great perfume year for me!! And I haven’t even included so many other perfumes I discovered/re-discovered and that I really liked/loved like By Kilian Sweet Redemption, Ormonde Jayne Ta’if, Guerlain Mitsouko, Aftelier Tango, Fig, Mona di Orio Oud. So considering how many I didn’t mention, I think 12 is a very small number, don’t you? HAPPY NEW YEAR! and hope all your fragrant (and non-fragrant) wishes come true! What a fabulous post! You always have such an easy way with words and you’re such a pleasure to read. I hope you have a wonderful New Year! Thank you so much, Carrie! Coming from you that means a lot. Hope you have an amazing New Year with even more milestones to add to this year’s. It is so great that you can share your passion with your mother! Thanks Birgit! A very Happy New Year to you and your family too!! Wonderful list Lavanya! You’ve picked some of my faves and some new (and old) ones I still need to try. I hope you have a lovely new year. Thank you Trish- I hope you are able to try them- I have a bunch of stuff to try from your list too and am looking forward to doing so..A very Happy New Year to you too! Thank you so much, Lavanya! Your blog is a new discovery for me and it looks like I have some great reading to do! Thank you so much for including Pandora on your Top Ten list for 2011! I’m totally stunned and beyond delighted to know how Pandora touched you and reminded you of your grandmother. It’s a story I will cherish; thank you for sharing it. You are very welcome, Dawn! I am very grateful for independent perfumers like you and Mandy and am excited to try more of your creations. Sounds like 2011 was a great perfume year for you, Lavanya. It great when you can finally splurge on some of your favourites. Loved reading about your mother – what great taste! It amazes me how my Mum and sister are able to instantly pick out notes in perfume and put me to shame! Oh and I made that spicy cauliflower soup today for lunch and it was great, so many thanks! I’m glad you made that soup- I still need to make it- hopefully one of these days. Thank you so much Lavanya! I am so delighted with this wonderful honor of having 2 perfumes in your Best of 2011! I am touched by your very personal perceptions and beautiful writing, looking forward to lots more! What a wonderful list! It sounds like it was a bountiful year for you, and I’m hoping 2012 is just the same! Thank you so much, Natalie! Hope you have a wonderful 2012 too! I enjoyed reading your list. I tried only half of perfumes you’ve mentioned (and loved half of those). Now I’m curious to re-test a couple that were just OK when I tested them for the first time. Oh- yes- I remember that post by you about Miss Dior (I think I read it either just before or maybe after I bought by vintage mini). I do think you will really like Le Temp though. Hi there every one, here every person is sharing such knowledge, thus it’s good to read this blog, and I used to visit this website all the time.